How Can I Tell If a Fire Extinguisher Needs to be Recharged? Keeping a fire extinguisher properly charged or pressurized is an extremely important step in owning and maintaining a fire extinguisher. If regular fire extinguisher service and maintenance is not performed, that extinguisher may not work when you need it most. Even if the portable extinguisher has never been used, it should be properly maintained to ensure it operates when or if a fire should occur. There are several reasons it is necessary to recharge a fire extinguisher. While some of these reasons may seem obvious, some reasons may not be quite so evident. If your fire extinguisher has been used, it needs to be recharged immediately. Even the smallest discharge of the extinguishing agent can result in leakage, and eventually the pressure needed for proper operation is lost. According to 2018 NFPA 10 7.8.1.1, all rechargeable-type fire extinguishers shall be recharged after any use or when the need is indicated by an inspection or servicing. For the most commonly used ABC dry chemical fire extinguisher, internal inspection and recharging is required at six and twelve years from the manufacture date. This date will be notated on the extinguisher. These inspections are important, even if the extinguisher has never been used. Please check the NFPA 10 code and the manufacturer’s service guidelines for the periodic internal examination and recharging requirements. Extinguishers also need to be recharged and examined if they show any of the following deficiencies: low-pressure reading, illegible operating instructions, broken or missing safety seals and tamper indicators, obvious physical damages, corrosion, leakage, or a clogged nozzle. This is all notated in NFPA 10 7.2.3.1. If you notice anything listed above, be sure to have the fire extinguisher serviced and recharged immediately. It is also important to note, if you have a non-rechargeable fire extinguisher, it should be disposed after it is used or shows any signs of damage or other environmental factors that may have resulted in it becoming depressurized. On a monthly basis, you should do a quick inspection of your fire extinguisher to look for any obvious physical damage and to ensure your pressure gauge is still registering within the operational zone. The gauge will clearly tell you whether the unit is undercharged, overcharged, or within the operational zone. The needle point needs to be within the green area on your pressure gauge. All fire extinguisher recharging should be completed by a trained professional. Fire protection companies, like Koorsen Fire & Security, have the tools and training to ensure that your extinguisher receive the proper service and maintenance. To ensure your fire extinguisher is in good working condition and meets all of the NFPA standards, call the experts at Koorsen Fire & Security. 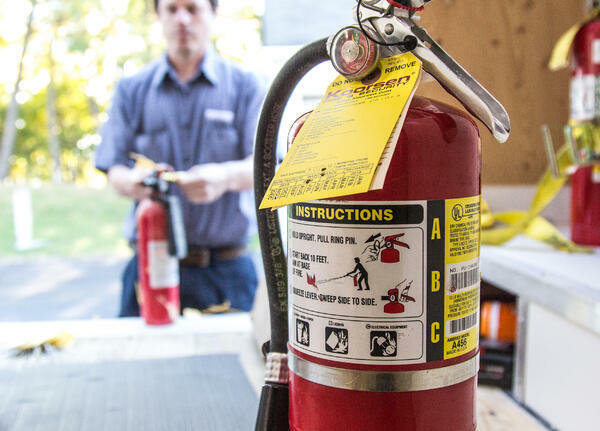 One of their highly trained technicians can answer all of your questions and even visit your place of business to help identify your fire extinguisher needs. Koorsen Fire & Security can help to provide the highest quality products, training, and service for all of your fire extinguishers. What is Hydrostatic Testing of Portable ABC Fire Extinguishers? Is a Fire Extinguisher Cabinet Required?